Above, a manatee bears scars from a boat hit. Because of escalating threats, manatees still need to retain their endangered status and the protective measures that only the Endangered Species Act can provide. In January, the U.S. Fish and Wildlife Service (Service) announced a proposal in the Federal Register to downlist West Indian manatees from endangered to threatened status throughout their range, including both the Florida manatee and the Antillean subspecies, the latter of which occurs in the Wider Caribbean. Scientists invited by the Service to peer review the proposal opposed downlisting the species, citing continued habitat concerns and lack of sufficient data, particularly for the Antillean manatee. Click the following link to see a summary of the scientific peer review comments submitted to the Service (links to the full comments are included at the end of this release). The Service’s downlisting proposal stated for the Antillean manatee that “...population trends are declining or unknown in 84% of the countries where (Antillean) manatees are found.” Patrick Rose, Executive Director of Save the Manatee Club, said that based on the agency’s own findings, it makes no sense for the Service to downlist Antillian manatees. For the Florida manatee, the Service concluded that threats are being “addressed and reduced throughout the species’ range,” but Rose said, “It is absolutely false that threats are being adequately addressed or reduced. The Service is turning a blind eye to the ongoing destruction of the manatees’ habitat even though the Endangered Species Act requires the agency to base its listing determination, in part, on the destruction or modification of a species’ habitat.” Rose said that the likely loss of winter warm-water habitat, identified by the Service as one of the main threats, is barely being addressed at all. Dr. Katie Tripp, the Club’s Director of Science and Conservation, further explained that Florida manatees have experienced unsustainable levels of mortality linked to Unusual Mortality Events (cold-related deaths and deaths from largely unknown causes in the Indian River Lagoon), and that Recurring Mortality Events (red tide) have not been properly addressed in the downlisting proposal. “Much work needs to be done to safeguard Florida’s water quality and spring and river flows before the Service can say the manatees’ future is secure,” Tripp said. In a show of overwhelming support not to reclassify the manatee at this time, the Service received nearly 87,000 comments and petition signatures in opposition to the downlisting during its 90-day public comment period, which closed on April 7th. In stark contrast, the Service received only 72 comments supporting downlisting. “The Service asked to hear from the public and from the scientific community, and the message they received in return was that the agency should abandon this misguided proposal and get to work on the critical projects that must be implemented before a legitimate downlisting can be considered,” said Tripp. It will likely be early in 2017 before the Service announces its final determination about the manatees' status. Although the public comment period is over, Save the Manatee Club says there is still time for citizens to contact their members of Congress and ask them to speak up and oppose the manatees’ downlisting at this time and until the species’ future is secured. Click the following link to get more information on manatees and the downlisting issue. Save the Manatee Club's official comments to the U.S. Fish and Wildlife Service from Dr. Katie Tripp, Save the Manatee Club Director of Science and Conservation. Comments to the U.S. 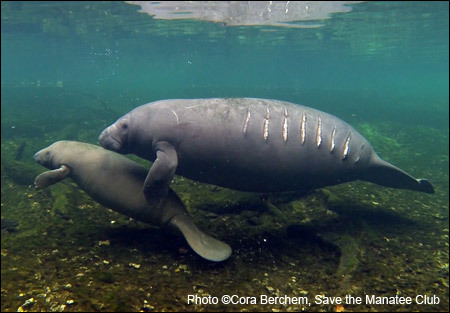 Fish and Wildlife Service on behalf of Save the Manatee Club from Eric R. Glitzenstein of Meyer Glitzenstein & Eubanks LLP, focusing on legal deficiencies in the proposal reclassification. Comments to the U.S. Fish and Wildlife Service from Anne Harvey Holbrook, Staff Attorney for Save the Manatee Club. Read a petition to Dan Ashe, former Director of the U.S. Fish and Wildlife Service, submitted by Save the Manatee Club on behalf of 11,368 people who signed it.